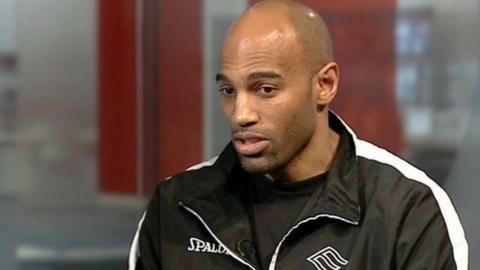 Player-coach Fab Flournoy has said there will be no "knee-jerk reaction" regarding his future after Newcastle Eagles' play-off final loss on Sunday. The Eagles, chasing a 19th honour, were beaten by Worcester Wolves at the final hurdle, their second play-off showpiece defeat in as many seasons. "We'll evaluate my situation just like we'll evaluate every player in this team," Flournoy said. "There won't be any knee-jerk reactions after a one-off final." He added: "It shouldn't take away from what has been accomplished for both teams in and around the season." Flournoy, 40, has been with the Eagles since 2001 and became coach for the 2003-04 season. He has since led the club on a run of success that has seen them win every domestic honour, including two clean sweeps and five personal coach of the year awards. Sunday's setback against the Wolves was the second final the Eagles have lost this season, having already slipped to defeat by Leicester Riders in the BBL Cup. "Our team, outside of myself, Charles (Smith) and Scott (Martin), let the moment get to them," Flournoy said. "It's not that they weren't trying but there were a lot of inexperienced players."